A great victory for Bike Board!!! Another great match was held today for the 6th stage of Bike Odyssey 2018. After today’s results, the situation has changed drastically for the 8-days rave, as Maciejowski and Mossoczy (BikeBoard) achieved their goal of reducing the difference between themselves and the first team in the overall classification. The difference has now fallen to four minutes and now everything will be judged in the two remaining races. 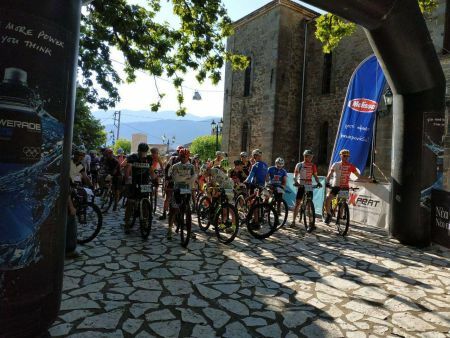 At the same time, the first stage of the southern three-days race was held, which was full of odd but welcome surprises. For once, we had a clear winning team, that of Papasavvas and Matsoukas (Sinetairoi), who took the lead of the race from the very beginning, giantificating it in the proccess. On the other hand, an interesting battle for the second and third place took place, the landscape of which was clarified in the last few kilometers of the race. In more detail, the 6th stage of the 8-days race began with the first three teams of the overall classification taking a clear lead against their rivals, forming a group of athletes inseparable from one another up to the 2nd check point. Those were the teams of Maciejowski - Mossoczy (BikeBoard), Kalogeropoulos – Papanikolaou (Pedal Force One) and Christou-Cole (Animal Rights). Close by the third check point, the scenario of the previous matches was once again repeated, as BikeBoard and Pedal Force One teams gradually gained a small lead from Animal Rights, which continued growing slowly but steadily. At this point the Poles were in the lead two minutes ahead of the Greeks - close by the 3rd checkpoint - with the two teams preparing for the last part of the stage. The Poles raised their lead to three minutes, but shortly after, Papanikolaou and Kalogeropoulos begun their counter-attack and gradually started reducing the gap more and more. However, Pedal Force One took another unfortunate hit foryet another stage, as they suffered a flat tire and were forced to lose precious time, giving BikeBoard the opportunity to build a major difference and take the win, eleven minutes ahead of their hunters. A secondary but pretty intersting battle took place for the rest of the top six of the 8-days race. Up until the 2nd check point, Best Men of Tsoulouhas and Sotiriou followed steadily four minutes behind third place, having behind them four teams that also followed in a short distance: Samoladas and Fragoulis (Vita4you.gr), Daan De Backer and Andy Standaert (Ouzo? Azo!) and Jorgensen Lars with Larsen Bjarne (Pingel Mtb Race & Fun DK). After the 2nd check point the group of those teams gradually moved further behind the front runners, and, thus, reaching the 3rd check point, Ouzo? Azo! were following ten minutes behind Animal Rights, having passed in front of Best Men, who had fallen in fifth place, just seconds behind fourth place. 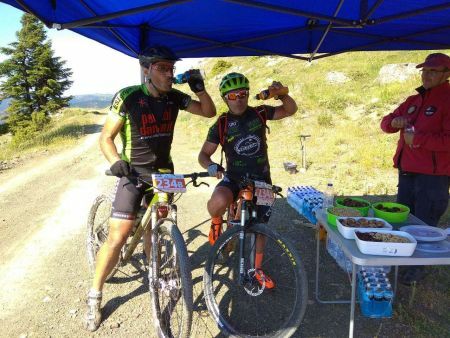 Pingel Mtb Race & Fun DK were seven minutes behind, with Vita4you.gr in seventh place. In the last part of the race, those teams begun to raise their pace aiming for the best possible outcome, without however achieving anything noteworthy. Ouzo? Azo! won fourth place, while Pingel Mtb Race & Fun DK went up to fifth place, dropping Best Men to sixth place. Vita4you.gr remained in and won seventh place. The southern 3-days race proved to be oddly interesting, as its first stage included a big and undisputed winner, as well as an interesting battle for the second and third places. Team Sinetairoi of Papasavvas and Matsoukas took an early and significant lead, which they did not only retain but also grew more and more during the race, finishing in first place, with a difference of fifty plus minutes from second place. In this emphatic way, they were introduced to the audience of Bike Odyssey, establishing themselves from the get go as the undisputed favorites in the 3-days south race. A great battle was given for the second and third place of the race. At first team Red Arrows Team of Stathis and Koutsothanas were in second place, being followed two minutes later by Rizos and Tamparopoulos (West Bikers) and team MA..MI of Manolopoulos and Mikes. By the 2nd check point the West Bikers had went up to second place, being followed by MA..MI, Mauden Hill Cycling of Perdkaris and Tsoharas and team Red Arrows Team. Those teams formed a group that was riding together, creating great interest for its final formation. Close by the 3rd check point, the teams had slightly opened up their distances, with West Bikers remaining in second place with a mere one minute difference from team Red Arrows Team. Mauden Hill Cycling were in fourth place, a minute behind. MA..MI had fallen to seventh place and held on to it until the end. In the last part of the stage, the teams had begun to rise their pace trying to claim the best possible position. Being steadily in fourth place for the biggest part, Mauden Hill Cycling launched a major attack, winning third place and even threatening to seize second place. Eventually they did not manage to overcome West Bikers who finished in second place with just one minute difference from their hunters. MegasYeeros.gr of Douvikas and Gouvas took fourth place, who, by launching an attack in the last few kilometers, ascended gradually, dropping Red Arrows Team in fifth place. In conclusion, today's day was marked by a big derby that significantly changed the balances for the 8-days race and a strong match of identifying nature in positions two to five, as Papasavvas and Matsoukas emphatically imposed themselves as the undisputed favorite of the 3-days south race. We now look forward to the two remaining stages to see who will be the winner between BikeBoard and Pedal Force One, and how the landscape will be shaped in the southern three-day race.